Replies: 4 (Who? ), Viewed: 693 times. 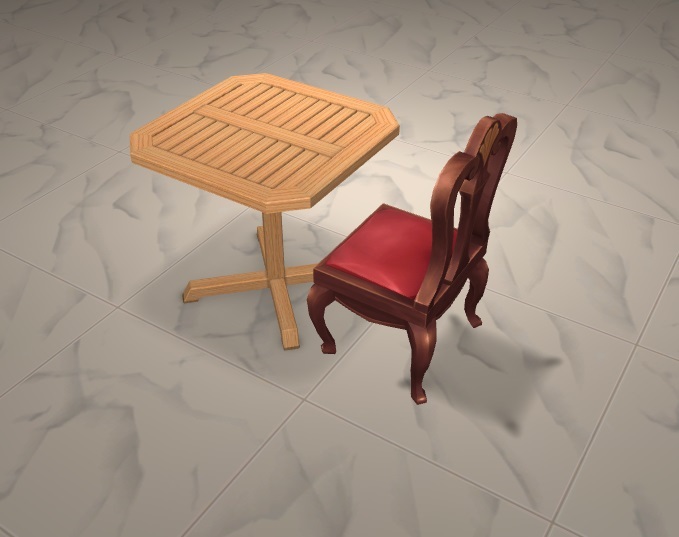 I'm trying to convert a chair from The Sims 4, but when the chair is put together with a dining table the shadow doesn't move with it. Does anyone know what is happening? What did you clone? The shadow not moving with the chair is a known issue with barstools - I've never seen that happen with a dining chair. OR, in case I'm not completely understanding your post, is that where the shadow is no matter where you place the chair (like not in front of a table)? If so, you'd need to move the shadow mesh to the right place in your 3D editor. I cloned the base game Cowboy's Caboose Chair, the shadow shows up in the correct place when the chair isn't attached to a table, when it is the chair moves foward but the shadow stays static. Just now got a chance to play around in SimPE. Since that chair doesn't have any joints I honestly don't know why the shadow isn't behaving - like I said, I've never used that chair as a clone. The shadow is it's own subset and I'm wondering if that has something to do with it - without the obvious joints in the GMDC... maybe something in the BHAVs, I dunno. HOWEVER - it'll be pretty easy to fix this. Just use a different chair as a clone and all should be well. The Contempto Penn Station Side Chair is a good choice.